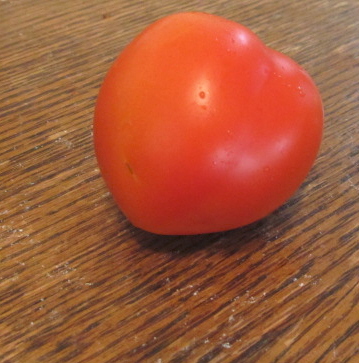 One lonely ripe tomato was all I had as of August 29. Up until this past weekend, I had only picked one ripe tomato off the Mexican Jungle that my veggie garden has become this year. Because of the Mexican Jungle effect, I can’t tell you the name of the variety, because the little tag got swallowed up by greenery. Let’s just say I planted things too close together, again. On Friday, before we left for the mountains, I picked some beautiful chocolate cherry tomatoes, and a couple of Romas, and some more of these, whose name I don’t know. There are a ton more green ones, threatening to knock over the trellises. As long as we don’t get an early freeze (average first frost date here is September 15, but last year it didn’t happen until early October) the green ones will get a chance to ripen and become salsa, and salads and tomato sauce, and maybe dried tomatoes. Nom nom nom. 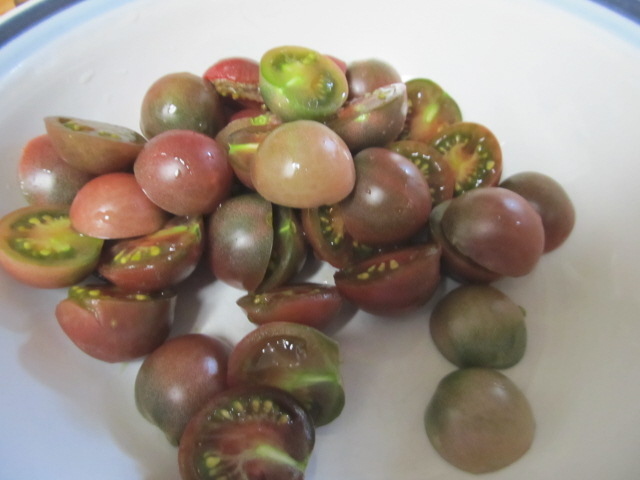 The grape tomatoes ripen a deep purple, and taste great on their own, but with these, I sliced them in half and threw them in with some pasta and vinaigrette. Now I have lunch this week. According to my journal, these are "Chocolate Cherry", started from seed by a friend. They go dark, almost army green before they go purple. They are rich and sweet and filled with jelly.